Ever since the Epiphone Dot was introduced over ten years ago, Epiphone's recreation of the venerable ES-335 "Dot" has been wowing guitar players all over the world. 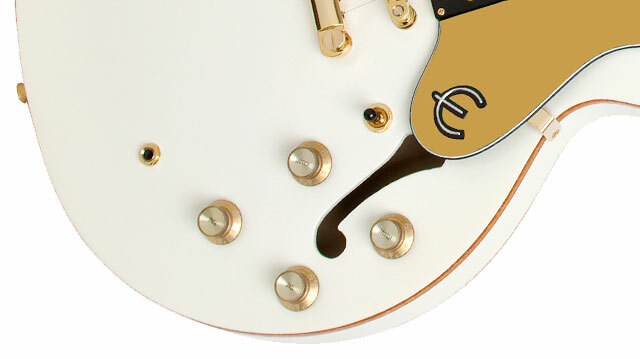 Now, the Dot Royale gives the ES-335 Dot tradition a whole new makeover with a stunning Pearl White finish, gold sparkle binding and gold hardware totally unlike anything Epiphone has offered before. Though Epiphone was long famous for its own original semi-hollowbody designs from the 1950s Kalamazoo, Michigan era, including the Riviera and Sheraton, the simple, classic ES-335 style was missing. The re-introduction of the Epiphone Dot, named in reference to its simple "dot" fingerboard inlays, now makes the legendary sustain and resonance of the 335 available to all guitarists without the vintage headaches or prictag. Now with the Dot Royale, this legend has an all new look. 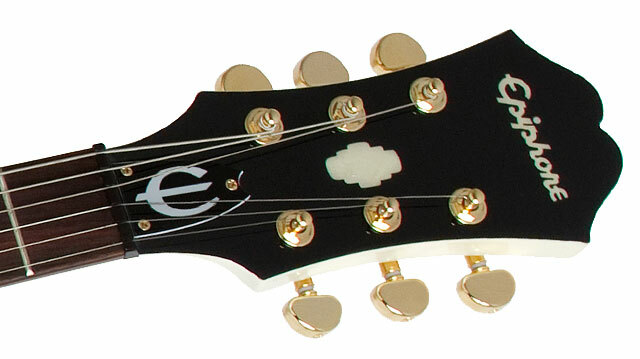 The Dot Royale is protected by the famous Epiphone Lifetime Limited Warranty featuring Gibson 24/7/365 Customer Service and guarantees the instrument against defects in materials or workmanship. Experience a Dot Royale today at your favorite Authorized Epiphone Dealer. The Dot Royale is constructed of premium laminated maple with a mahogany center block and a hand-fitted, glued-in mahogany neck. Other details include a rosewood fingerboard with traditional “Dot” inlay, quality electronic parts including full-size, 1” 500K Ohm potentiometers, Epiphone's all-metal pickup selector switch, historic metal Epiphone name “badge” on the headstock, and a heavy-duty output jack. Its fabulous semi-hollowbody sound is voiced by a pair of real Alnico Classic™ Humbucker pickups. 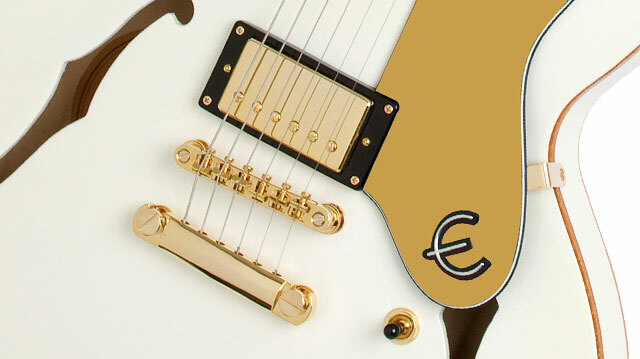 The pearl white finish and gold sparkle binding are complimented by a one-of-a-kind Epiphone gold pickguard. The Dot Royale features two Alnico Classic humbuckers in the neck and bridge position. Alnico Classics have all the key ingredients found in Seth Lover's original PAF humbucker pickups from the late '50s and give players an infinite variety of tones from rock to jazz to country. Each pickup's volume and tone controls feature full 1” 500K Ohm potentiometers for a lifetime of rocking. The Dot Royale includes Epiphone’s exclusive LockTone™ locking Tune-o-matic bridge and Stopbar tailpiece which yields even more sustain. And the Royale Dot also features gold hardware including premium 18:1 ratio Grover® machine heads for superior tuning stability and accuracy.